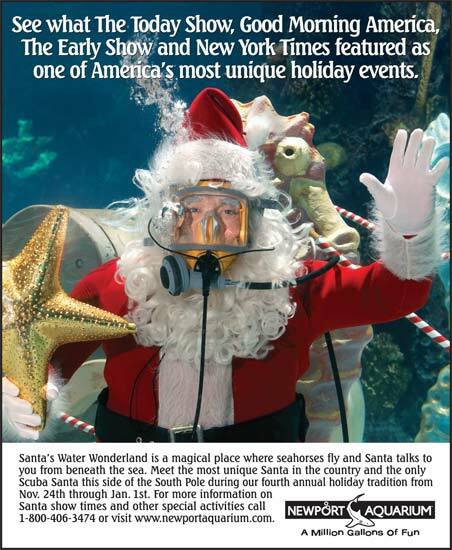 Santa’s Water Wonderland was a winter Holiday event we created that featured a “Scuba Santa” underwater in the shark tank. He sat in a sleigh pulled by giant seahorses and could talk to kids in the theater on the other side of the glass. One of the biggest challenges with this event was tying it to the brand. To do that, we had to answer the question of how Santa wound up underwater. We wrote and produced a commercial and animated short film that answered the question. Santa’s reindeer had run off – jeopardizing his ability to deliver everyone’s presents. When he heard of a magical place beneath the sea where seahorses fly he dove into the ocean to find it. The film played on the movie screen in the theater and when it ended, the screen rose to reveal the “Wow” factor – the shark tank with Santa in his sleigh driven by giant seahorses. This event received national media coverage as one of the most unique Holiday events in the country. It was featured on the Today Show, The Early Show, Good Morning America and in The New York Times two years in a row. It’s become a Holiday tradition for the region and The Kentucky Tourism Council has called it one of the Top Ten Holiday Events in the State.